- Make the most of your time with convenient email solutions, feature-rich Nokia Calender and contact for Eseries and improved easy dialing functionality. 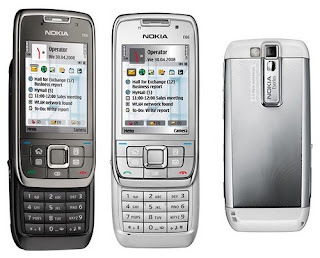 - You can switch from business to personal mode with a single click - giving you easy access to useful features including Nokia Maps, 3.2 megapixel camera, music player, and FM Radio. - You should know where you are and find where you're going with integrated assisted-GPS and Nokia Maps. - You can create a secure VPN connection to your company intranet on the go, and use your mobile device to connect your compatible PC to the internet with Nokia PC Internet Access. Eco Declaration provides information on the sustainability of the product (safety of materials, energy efficiency, packaging, recycling), based on scientific analysis and/or data provided by Nokia suppliers. This product complies with EU RoHS Directive 2002/95/EC and the China legislation “Management Methods on the Prevention and Control of Pollution caused by Electronic Information Products” commonly known as “China RoHS”. This product meets the Energy Star and EU Code of Conduct requirements. Do not dispose in unsorted municipal waste. For the nearest collection point for your used device and accessories, please see the Recycling Map of Nokia's over 4500 global collection points on http://www.nokia.com/environment. You can also always mail your used product to us and we will take care of its recycling. * All mechanical plastic and metal parts have been marked for recycling if practically possible. Plastic parts are marked in accordance with ISO 11469 and ISO 1043-1 to -4 standards. * All Magnesium (Mg) containing mechanical parts are marked to ensure efficient End-of-Life treatment. * Product has been marked according to WEEE directive requirement for recycling. * The battery can be easily removed without tools for recycling.